The complete Sept. 5, 1863, edition of the Los Angeles Star is available at USC and the California Digital Newspaper Collection. Sept. 5, 1863: Dr. J.C. Welsh is apparently too early to be listed in George H. Kress’ “A History of the Medical Profession in Southern California” (1910) — either that or the entry on him was lost when the material for the first edition of the book was destroyed in The Times bombing. Newmark says Welsh was a South Carolinian and a partner with Dr. H.R. Myles in a drugstore on Main Street. 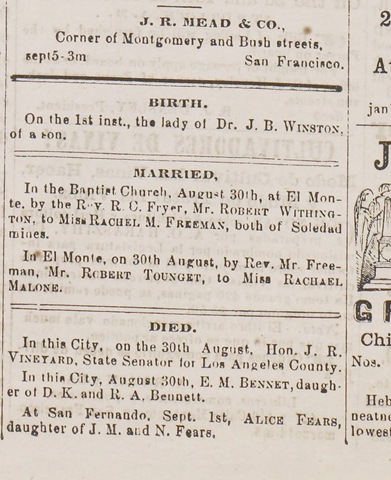 Welsh arrived in Los Angeles in the early 1850s died in August 1869, Newmark says. Born: A son to Dr. and Mrs. J.B. Winton. Married: Robert Withington and Rachel M. Freeman; Robert Tounget and Rachel Malone. This entry was posted in 1863, Medicine, Obituaries and tagged 1863, doctors, medicine. Bookmark the permalink.